We’ve all heard about how important exercise is and how sitting is the new smoking. Most of us step out our doors to go for a run or a hike or go to the gym for our workouts. What about those for whom exercise is not so easy? My sister and I both have a rare lung disease called Primary Ciliary Dyskinesia (PCD). In July of 2013 our doctor prescribed us both supplemental oxygen. My sister needed it full time. I only needed it for exertion, when I was working out. After hearing about her experience I held out for 8 months until I was able to get what I wanted for working out – a portable oxygen concentrator (POC). More importantly, a POC would be easier to carry for races. I’ve always been an athlete. I wasn’t about to let a little thing like low oxygen levels stop me from being an athlete. I did my first race in September of 2014 wearing a five pound POC on my back. I was preparing to do my second race, the Army Ten Miler, when I decided to start Running On Air. My vision for Running On Air is pretty big. For now though, we are focused on 1) raising awareness of rare diseases, lung diseases and supplemental oxygen, 2) encouraging those with limitations to be as active as they can, and 3) becoming a non-profit. One of the ways we do #1 and #2 above is through virtual races. Our first virtual race was in August 2015 and benefited the PCD Foundation. In February of 2016 we had our first virtual race for Rare Disease Day (February 29th that year) and benefited the National Organization for Rare Disorders (NORD). The other part of our virtual races is to encourage anyone to participate. Our PCD Foundation race is called “Move 4 A Cure 5-5-5”. This means participants can do 5 meters, 5K or 5 miles. 5 meters may sound ridiculous to those that are able bodied, but to someone with severe limitations, 5 meters is huge. We also say they don’t have to do the whole distance all at once. Since this race is in a month with 31 days, doing a tenth of a mile a day gives one a 5K for the month. Again, if you aren’t that active or have severe challenges these are huge steps. To date we have raised over $12,000 for non-profits that support rare diseases and lung diseases. 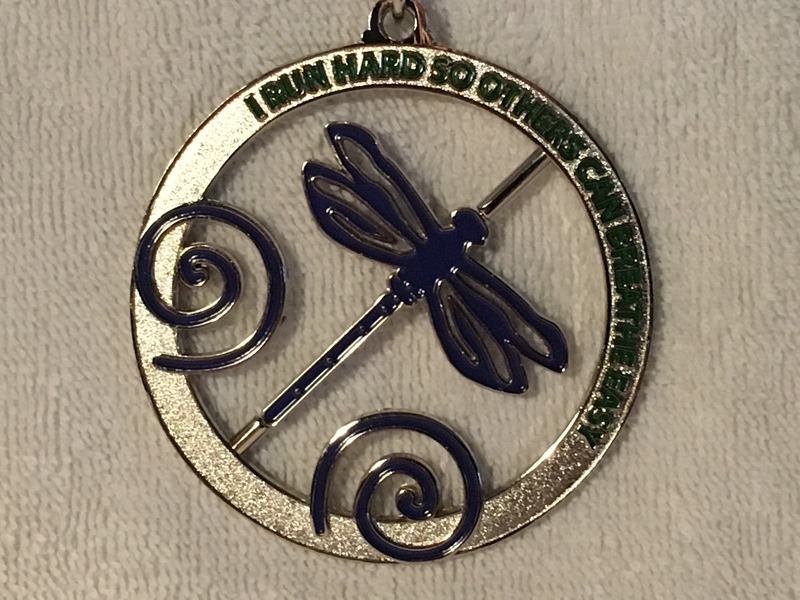 Part of our philosophy is to create beautiful, meaningful medals. We are especially happy with this year’s Move 4 A Cure 5-5-5 medal. It is the lungs with a spinner in the middle. There is a heart on one side that moves from the left to the right as the spinner moves. This is because half of those with PCD have some form of organ reversal, like the heart being on the right side instead of the left. The medal also has a built in stand so it can be put on a desk or table for display or hung by the ribbon. We also have a fundraising virtual race to help with our expenses. This year at least half of the profits from our Running On Air race are going to NORD’s Undiagnosed Disease Fund to help families that have exhausted all other resources to find a diagnosis. I am doing the New York marathon on November 5 as part of NORD’s Running for Rare team. The funds raised for NORD through this event are going towards my fundraising goal. Because we have two races going on at the same time, we are offering a discount for those that sign up for both using our Fall Double option. We are also offering a discount for Run the Edge followers of $5 off any of the virtual race registrations with promo code RTE5. Run the Edge’s virtual races have been instrumental for our goal of encouraging those with disabilities to be more active. We had a team of eight for the Amerithon Challenge. Four of us have PCD and the other four are spouses or moms of someone with PCD. We’ve also had several teams in the 2016 and 2017 Run the Year virtual race. This year we have four teams with twelve participants. 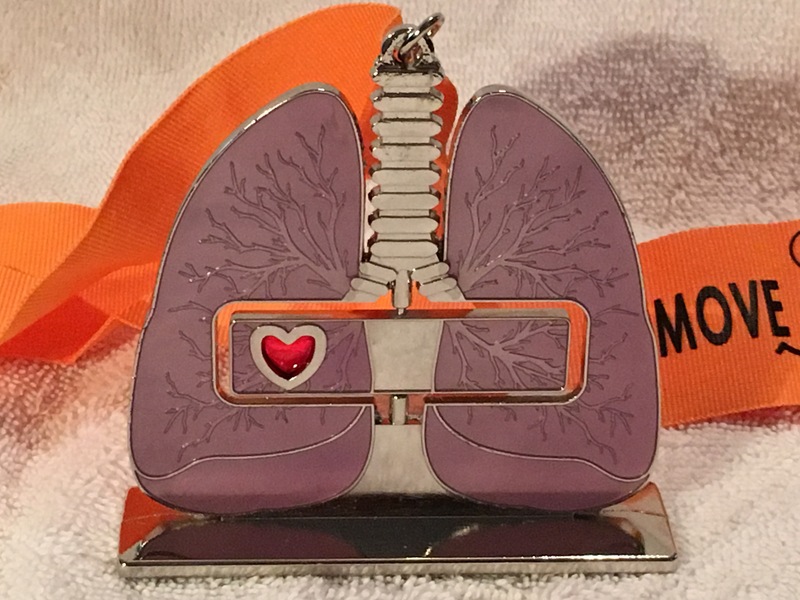 One of our participants had a double lung transplant in April, five of us have a lung disease, two of us wear oxygen, three of us are respiratory therapists, and three of us are moms and friends to someone with lung disease. We are currently forming Run the Year teams for 2018. We hope to have even more people on board and being active. We are also looking at hosting four virtual races in 2018. We will have our 3rd annual Rare Disease Day race in February and our 4th annual Move 4 A Cure race in October. We will likely have other races in April and July or August. You can learn more about Running On Air on our website www.RunningOnAir.org. You can also follow us on Facebook, Instagram and Twitter to keep up with our upcoming virtual races or to let us know if you want to be part of our Run The Year 2018 teams. Register for a virtual race and support Running On Air’s mission.